Needs 1 AA Battery (not supplied). Kitten Tickin' Wall Picture Clock 32cm. Pendulum tail. Suitable for wall mounting. 31-05-2018 16:10:36. No invoice or other order information will be enclosed. Skull Clock Spooky Gothic Rock Biker Emo Pagan Wall Hanging. DECORATIVE SKULL WITH ROSES CLOCK. It also has a cut-out for wall mounting. Each Picture Clock is made from MDF, the face of which has been covered with a decorative print. A classic skull design clock with intricate illustrations on a dark background. Part of the Cabinet of Curiosities range. Batteries not included. Adorable kitty wall clock with pendulum tail for all cat lovers Product Code: 21969. Approx size: 21.5cm x 30cm. Dark Angel and Raven Picture Wall Clock. Condition is Used but like new. Collection preferred, but message for postage options. Skull with Roses Shaped Picture Clock. .
Brush With Magic Black Cat Picture Wall Clock 30cm High Lisa Parker. 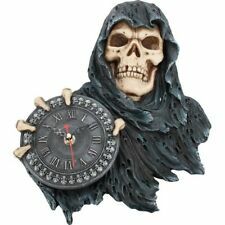 Gothic style Grim Reaper face of time wall hanging clock. He holds a clock with Roman numerals surrounded by skulls. "Times up" Perfect for the gothic alternative household or bar. Made from cool cast resin and hand painted to a high standard. Measures approx 29.5cm x 22.5cm x 4cm (11¾" x 9" x 1½"). Decorative Rise of the Witches Lisa Parker Wall Clock. Every room needs a clock and with our range of fantasy, funky and colourful MDF picture clocks you will find the design for you. Material: Wood. -Because the display is different,the color of the product will vary. -3D design, it looks more stereoscopic. The face of the clock is a wooden disc, similar to an honest wooden dining table. Over the top, a curious black kitten peers at you with curious green eyes, ears erect and alert. Below the clock, the kitten’s tail hangs down and swings as the clock’s pendulum. Cabinet of Curiosities Skull Clock. 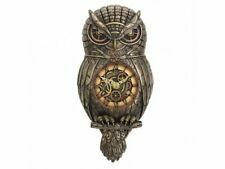 Steampunk inspired mechanical looking owl wall clock. Made from a high grade cool cast resin and hand painted in bronze colours. Ornate gold coloured hands and Roman numerals on the clock face. Cog effect detail for the eyes and on the clock face. Moving/swinging tail pendulum. Measures approx 32cm x 14cm x 5.5cm (12½" x 5½" x 2¼"). In front of a red, diagonally checked background, this young harlequin wears a red and black gothic jester´s outfit, each side in a different design. Design: Gothic Heart. Requires one AA Battery (included). Each Clock is signed and numbered on the back, as shown in photo. A rare and unique piece that you won’t find anywhere else! Item Hand Painted Vinyl LP Record Clock. The Clock shows a Grim Reaper, laughing mockingly, clutching a black and gold clock in its skeletal hands. It also has a cut-out for wall mounting. This Clock has been cast in a high quality resin, and finished by being hand-painted. Each has their claws gripped onto the edge of the clock as their tails entwine around the others. Dragon Duel Wall Clock. Function: Wall Clock. Fantasy Design Dark Angel with Raven Wall Clock. Every room needs a clock and with our range of fantasy, funky and colourful MDF picture clocks you will find the design for you. All orders dispatched within 24 hours. Fun Novelty Police Box Shaped Wall Clock. Every room needs a clock and with our range of fantasy, funky and colourful MDF picture clocks you will find the design for you. Climbing atop a large Dragon egg, the red Dragon looks down and roars at any predator. The light shading in the spikes that cover her spine add a depth to the creature. The egg itself has several cracks surrounding the clock face, as through her hatchling is attempting to break free. The face of the clock is a wooden disc. Over the top, a curious black kitten peers at you with curious green eyes, ears erect and alert. Below the clock, the kitten’s tail hangs down and swings as the clock’s pendulum. Glass material makes the design vibrant and bright. Every room needs a clock and with our range of fantasy, funky and colourful MDF picture clocks you will find the design for you. This product is subject to specific safety warnings. Product Safety. ALCHEMY SKULL WALL CLOCK, TEMPORE MORTIS, GOTHIC. 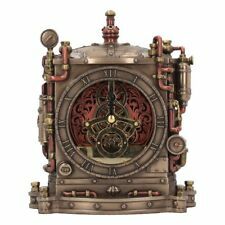 TEMPORE MORTIS WALL CLOCK. Skull wall clock. The ever watchful chronicler of your remaining hours. Requires 1 x 1.5v AA battery (not included). From Alchemy's 'The Vault' range. 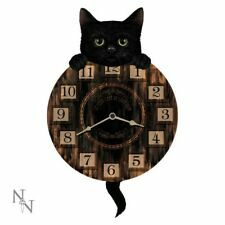 Lisa Parker What Lies Within Cat Design Picture Clock. .